How to estimate shipping fee? You will only know your exact shipping fee once you place order and goods arrive in our warehouse. Then we will know the exact weight of the products and we can calculate shipping fee. As you know that shipping fee depends on the weight of the shipment. For the time being you may estimate your shipping fee. For which countries, you can handle customs? Customs situation could change for any country without prior notice. Shipping by EMS/DHL/TNT takes around 3 to 5 days to over 100 countries. In general, your parcel shall arrive within 7 days anywhere in the world unless it's held by the custom office. Using our courier partners which handle customs as well, it may take around 3 to 7 days for goods to arrive in all listed countries. Can I use my own forwarder? Yes, you can engage your own forwarder. 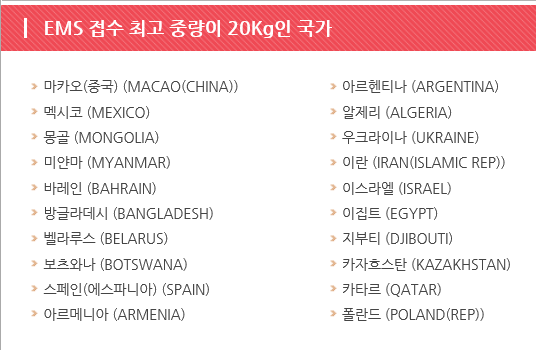 We will make delivery within Korea to your forwarder warehouse. Once the goods are delivered to them, you have to deal with your forwarder directly afterward. Custom duties & taxes are included? We provide the one-price shipping fee including custom clearance, taxes and duties by air-freight for some countries if using our appointed forwarder: Philippines, Indonesia, Malaysia, Vietnam, Thailand, Myanmar, Singapore, USA, Taiwan, Hong Kong & Japan. For other countries, the shipping fees are NOT inclusive of custom duties and tax. However, we take the following precautions to smooth the custom clearance. Low Value Declaration : Low Value Declaration: Usually we declare every carton less than $100 as small value parcels are not held by custom in most countries. Divide Shipment: If you have a few cartons to be shipped, we may send each carton at different days or could send to different people you suggest such as your family members or your friends. If there is just one carton under one name at custom, it's less likely it will be held by custom. Under Invoicing: If you need us to provide you with under-valued invoice, we can do that. What shall I do if I receive the wrong items? If you received the wrong items, please contact us within 5 days after receiving your items. Any claim afterward will not be entertained. Sometimes, products are renewed and their packing is changed or they have an additional gift item along. Such cases are not treated as wrong item. Can you help to under declare and under invoice our order? Yes! we can under declare your goods and also issue you under valued invoice in order to help you out to reduce custom duties and taxes. Please let us know the amount you want us to declare, before your order are shipped. Do you deliver locally within Korea? Below are the lists of countries where EMS, DHL & TNT shipping services are available. It covers almost every country on the earth. Do you put invoice in the cartons? No! we do not put invoices in the carton rather they are sent via email. If ever you received wrong products by mistake, please take the picture of carton outer side, wrong products received and send us via email. We will investigate and handle it as soon as possible. Do not open the wrong sent products and keep them safe. We might need you to send them back. What is the maximum carton weight you pack? Why on tracking it still shows my parcel at outbound office for many days? If tracking shows "At out bound office" for many days, then it's likely that your parcel is held by custom. Please contact local post office and give them your tracking numbers to check the status and follow up.